Home » Posts Tagged "Milewsky P."
Durey, M., & Milewski, P. A. (2017). 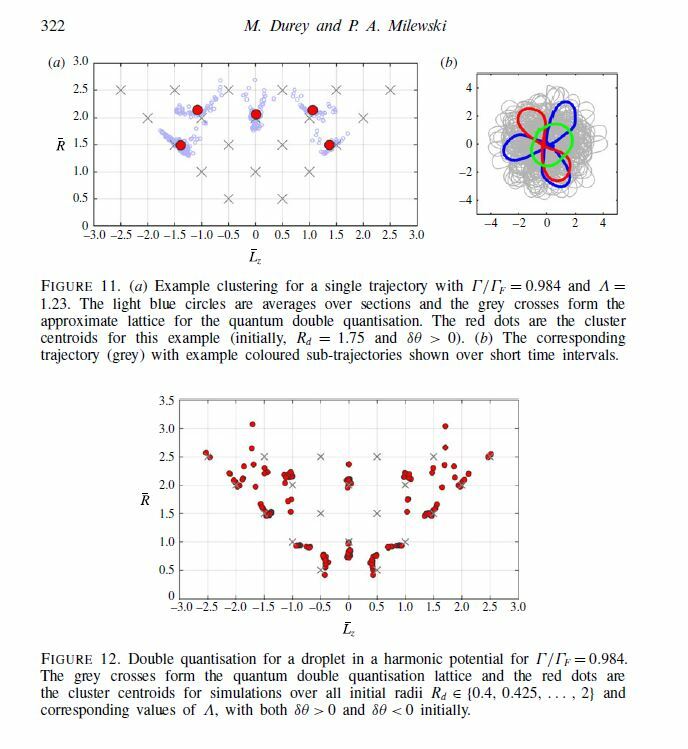 Faraday wave–droplet dynamics: discrete-time analysis. 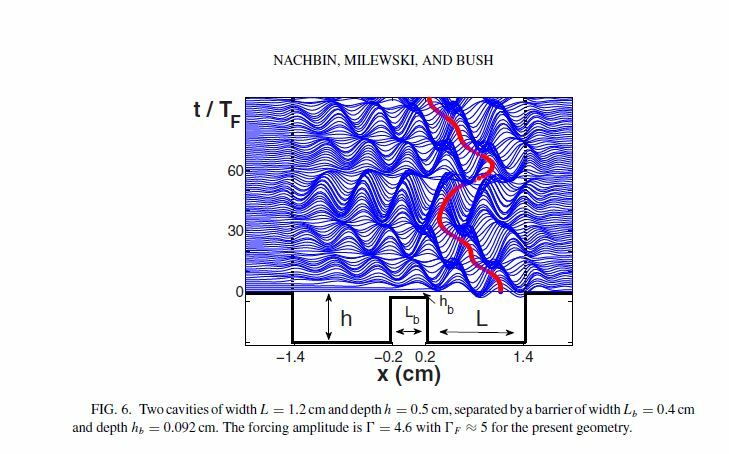 Journal of Fluid Mechanics, 821, 296-329. ABSTRACT : “Eddi et al. [Phys. Rev Lett. 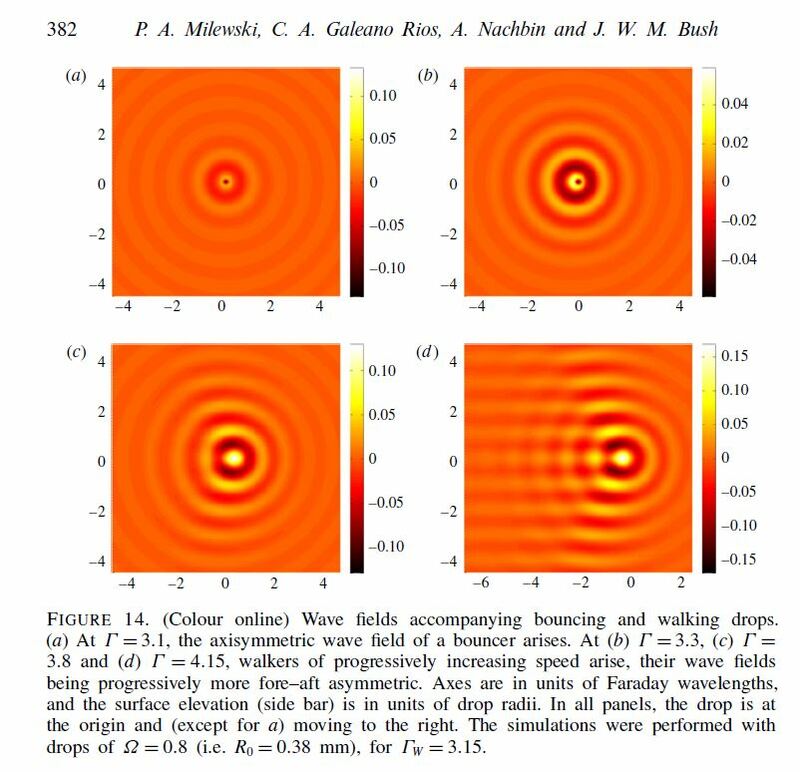 102, 240401 (2009)] presented experimental results demonstrating the unpredictable tunneling of a classical wave-particle association as may arise when a droplet walking across the surface of a vibrating fluid bath approaches a submerged barrier.We here present a theoreticalmodel that captures the influence of bottom topography on this wave-particle association and so enables us to investigate its interaction 2 with barriers. 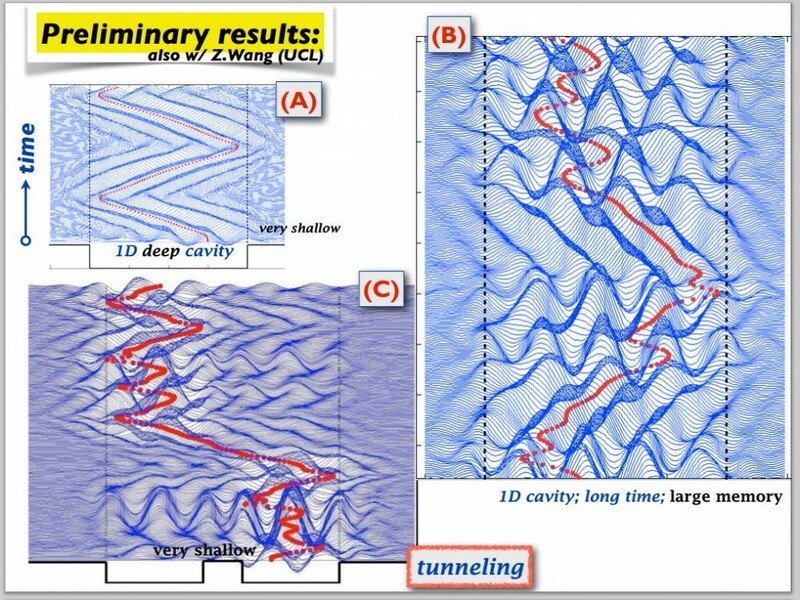 The coupledwave-droplet dynamics results in unpredictable tunneling events. Milewski, P. A., Galeano-Rios, C. A., Nachbin, A., & Bush, J. W. (2015). Faraday pilot-wave dynamics: modelling and computation. Journal of Fluid Mechanics, 778, 361-388. A millimetric droplet bouncing on the surface of a vibrating fluid bath can self-propel by virtue of a resonant interaction with its own wave field. This system represents the first known example of pilot-wave system of the form envisaged by Louis de Broglie in his double-solution pilot-wave theory. 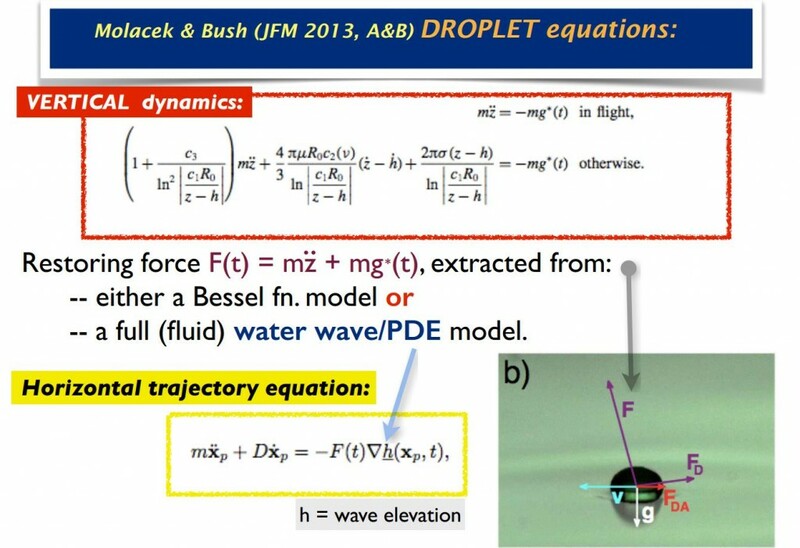 We here develop a fluid model of pilot-wave hydrodynamics by coupling recent models of the droplet’s bouncing dynamics with a more realistic model of weakly viscous quasi-potential wave generation and evolution. 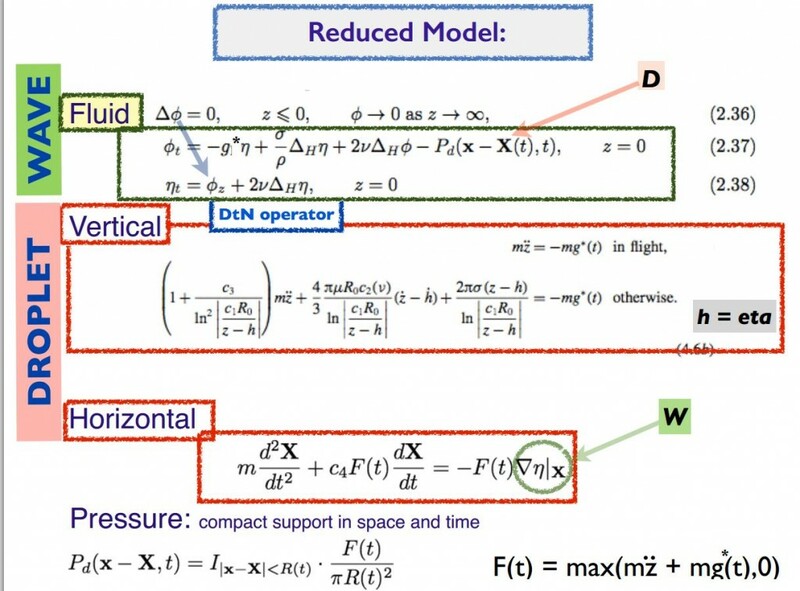 The resulting model is the first to capture a number of features reported in experiment, including the rapid transient wave generated during impact, the Doppler effect and walker–walker interactions. Paul Bancroft on Superposition, Decoherence, Schrodinger’s Cat and other magical lies my professors told you. Bob on Superposition, Decoherence, Schrodinger’s Cat and other magical lies my professors told you. Andersen A. Anderson R. Bach R. Bastin T. Batelaan H. Boudaoud A. Brady R. Brun P. T. Bush J. W. Couder Y. Cristea-Platon T. Decelle A. Dorbolo S. Eddi A. Ellegaard C. Faria L. M. Filoux B. Fort E. Galeano Rios C. Gautier C. H Gilet T. Harris D. M. Hubert M. Labousse M. Lautrup B. Lieber S. I. Madsen J. Martin J. Milewsky P. Moisy F. Molteni D. Moláček J. Moukhtar J. Nachbin A. Oza A. U. Perrard S. Protière S. Pucci G. Reichelt C. Rosales R. R. Saenz P. J. Schlagheck P. Terwagne D. Vandewalle N. Wind-Willassen Ø. All photos and videos presented on this website are our own work unless mentionned otherwise, or included in the "bibliography" section.